Katie John Tucker's family has recently inherited Great Aunt Emily's large old Southern house, so they must spend the summer cleaning it up and getting it ready to sell before they move onto New York, where Katie's father can resume his writing career. Katie is not thrilled about spending the summer in such a small town, but that changes when she meets Sue, a girl in the neighborhood with whom she shares many adventures. The girls look for ghosts, discover a possible human bone, have a lemonade stand, and get into a big fight (and make up, of course.) When Fall rolls around, Katie finds that she doesn't want to leave - and that she might just have a plan that will help her family stay in the big house. I owned this book as a child and never read it. Knowing what I was like, this was probably because the first chapter mentions the possibility of ghosts and I hated to be scared. Otherwise, this is exactly the kind of book I have always enjoyed, about real kids doing regular things and finding their own excitement. Katie John has much in common with contemporary characters like Ivy and Bean, Clementine, the Penderwick sisters, and Judy Moody, and her personality is just the right combination of sweetness and trouble. 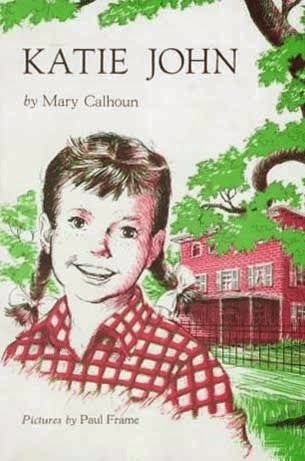 Though this book was published in 1960, there is no reason kids today - especially those living in small towns themselves - can't relate to Katie. Her concerns about moving, making friends, and figuring out what made Great Aunt Emily tick are things that will always interest kids, no matter the time period. Katie John also makes a nice read-alike for another vintage favorite from around the same time, Gone-Away Lake. Chloe loves to make lists. On Christmas Eve, when she heads to work at the grocery store, she has in mind her to do list, which includes resolutions to talk to at least three coworkers and learn something new about them, and to give Tyson, her crush, a ride home. Throughout her hectic shift, Chloe also worries about her blood sugar. As a "brittle" Type I diabetic, she can't afford to skip meals or miss out on checking her blood sugar levels at regular intervals. When it is discovered that a serious amount of money has been stolen from a charity donation box, Chloe is kept after hours along with her five other teen coworkers, all of whom are suspects in the theft. As the time before the cops arrive drags on, Chloe realizes that she will soon be in a real medical emergency if she does not enlist the help of her unlikely companions. In the meantime, she also tries to solve the mystery so that she and her new friends can make it home in time for Christmas. This is the perfect YA read for the Christmas season. It includes a little bit of everything - the anticipation everyone feels on the night before a major holiday, the urgency of last-minute shopping, the promise of a new crush, a secret medical condition to build up suspense, a bit of mystery, with a surprising culprit, and a fun and quirky setting. Chloe's lists serve to keep the reader apprised of her innermost thoughts, and her awkwardness with her coworkers is something to which all teens can relate. Putting the teens on lock-down in the manager's office is reminiscent of movie favorites like The Breakfast Club and Empire Records, and though it might not be a wholly realistic occurrence, it's the perfect plot device for turning strangers into friends, and it is believable in context. There are only two problems with this book. One is the cover, which provides absolutely no information about the story whatsoever. The cover seems very middle grade, even though the story is clearly YA, and aside from vague similarities to the cover for The Fault in Our Stars, it is basically unappealing. It's a Christmas book published just before Christmas - would it have been so terrible to give it a festive cover? The other issue is the "brittle" diabetes. The last fictional character who had this condition was Stacey McGill in the Baby-sitters Club, and the severity of her condition is frequently mocked and questioned by fans of the series. Because diabetes is so much easier to manage nowadays than it used to be, it does make sense that Chloe's condition would have to be "brittle" for the medical events of the story to happen, but it also seems like the same end could have been achieved with a more common problem, like a food allergy or asthma. By including this rare form of diabetes, the author simply reinforces stereotypes people have about Type 1 diabetes and misses an opportunity to educate the uninitiated about the truth of the condition for most people. 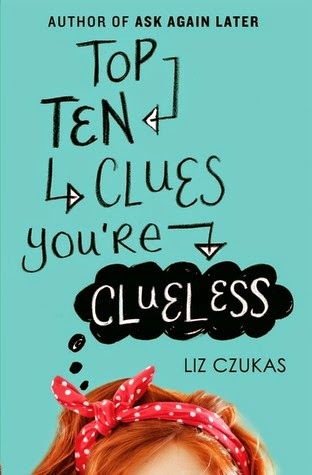 Top Ten Clues You're Clueless is a perfect read-alike for Love and Other Perishable Items as well as other YA workplace stories including How Zoe Made Her Dreams (Mostly) Come True, and Pilgrims Don't Wear Pink. 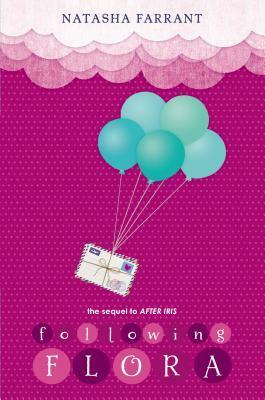 Following Flora is the second book in the Diaries of Bluebell Gadsby series, following last year's After Iris. (In the UK, the title is Flora in Love.) A year has passed and Zoran, the family's au pair, has moved out and taken one of his guitar students, Zachary Smith, under his wing in the aftermath of Zach's grandfather's stroke. Zach instantly hits it off with Flora, the oldest Gadsby sister, who is just one of three Gadsbys involved in a romance. Blue has started dating her best friend, much to her utter confusion, and Twig has a crush on a girl in school which has completely changed his behavior. Only Jas is not in love, and she feels so left out she turns to poetry as her solace. In the meantime, the Gadsby parents struggle to accept that they are expecting a new baby. The characters in this series are so well-realized that the plots of the books are almost irrelevant. So many things are going on in Following Flora, to the point that there isn't really one main thread to follow, but it doesn't matter because the chaos is part of the fun of reading about this quirky family. Few family stories for kids are as honest as this one about the way parents and siblings really act with one another. While this book is by no means dark and dreary, it also doesn't pretend that life is an endless parade of sunshine and lollipops. Middle school readers in particular appreciate this type of honesty, and it is perfectly handled by Natasha Farrant. Often books like this which include transcripts of video make those sections of the book feel like gimmicky filler, but in Following Flora, as in After Iris, they are used perfectly to further the action of the various subplots. The really nice thing about having a camera's eye view of the action is that each member of the Gadsby family is able to assert his or her personality in just a few lines instead of the author spending pages and pages on describing each one. Because the family is so dramatic and chaotic, it only makes sense for them to act out their shenanigans on film, and for Blue, the quietest of the bunch, to be the one behind the lens. Following Flora reminds me a lot of Anne Fine's The True Story of Christmas, in that it brings family dysfunction to life in a way that is realistic and humorous at the same time. (Why are British authors always so good at that?) The interactions between the siblings also echoes the way the girls talk to each other in The Penderwicks, but the adult characters are much less stereotypically good in the Gadsby books. Readers who enjoy Hilary McKay's Casson family will be enamored of the Gadsbys in the same way, and everyone who reads this book will immediately start counting down to when the next book is out. 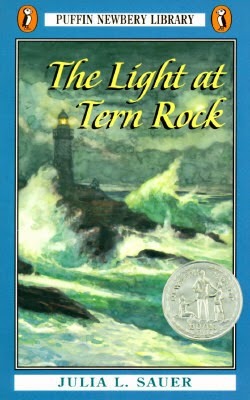 The Light at Tern Rock is a very short novel by Julia L. Sauer which received the Newbery Honor in 1952. The story follows a young man and his aunt, who are asked to look after the lighthouse at Tern Rock while the lighthouse keeper takes a few days of leave. The keeper promises he will return by December 15, but when this date comes and goes, and more and more days pass, Ronnie realizes he will miss the Christmas festivities with his schoolmates and be stranded on the rock for the holiday instead. I appreciate this book for its economy of language, its carefully presented moral, its unapologetic religious viewpoint, and its unexpectedly emotional ending. No one writes books like this anymore. For kids ages 8 and up, this is a much better lesson in the true meaning of the Christmas season than How the Grinch Stole Christmas. The story focuses not just on giving, but on forgiving, and on preparing oneself, wherever one happens to find himself, for the coming of Christ on his birthday. The story might seem slow to some kids, even with the low word count, but it would work nicely as a family read-aloud on Christmas Eve, or a component to a CCD or Sunday school lesson. Also see my review of The Birds' Christmas Carol for more inspirational Christmas reading. The book that helped me through my own traumatic friendship experiences in the 1990s was Just As Long As We're Together by Judy Blume, which I read and read until the cover nearly fell off. 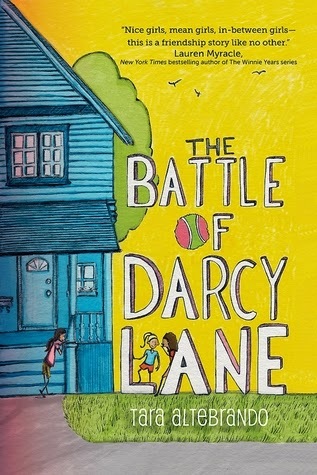 The Battle of Darcy Lane is that book for the 2010s. Girls will see themselves, their lives, and their feelings in this book and they will relish the knowledge that though they may feel isolated, they are by no means alone. I also loved Roomies, which is co-authored by Tara Altebrando, so now I'm really looking forward to her future books! 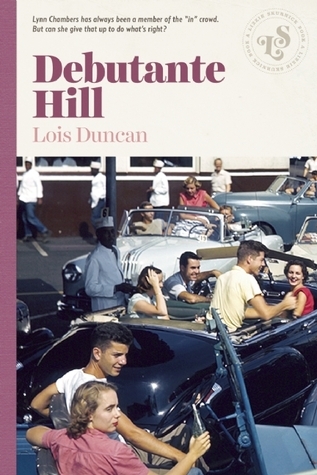 Debutante Hill was the first book to be reissued by Lizzie Skurnick Books. Though Lois Duncan is best known to people of my generation and younger as a writer of teen thrillers, this book does not fall into that genre. 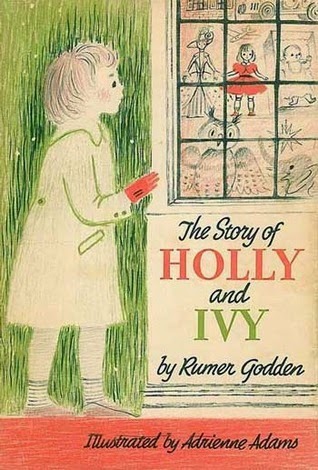 Published in 1957, it is the story of high school senior Lynn Chambers who is at the center of the popular crowd of kids who live on the Hill. When it is announced that the mother of one of the less-popular girls has decided to organize a debutante program in order to help her daughter improve her social life, it is just assumed that Lynn will participate along with her friends. To her great surprise, though, her father, Dr. Chambers, does not approve of his daughter making her debut. Suddenly, Lynn finds herself left out of everything. While at first it seems like a major disappointment, over time, Lynn's exclusion from the debutante events leads her to make a series of important discoveries about herself, her boyfriend, her friends, and some of her classmates who don't live on the Hill. I really love this book. I like its old-fashioned sensibility, which reminds me of Beverly Cleary's First Love books and the later books in the Betsy-Tacy series. I like that it takes a superficial experience - girls wearing gowns and attending parties in order to mark their entry in society - and turns it into a commentary on class distinctions, stereotypes, and popularity. The main character is not perfect, but she is open to change and willing to compromise, which makes her a worthy and believable role model. Even the romance storylines are handled with a heavy dose of realism - Lynn briefly dates a "bad boy" but the story resists the "good girl reforms bad boy" trope, and ultimately, Lynn is able to resolve her issues with her boyfriend in a calm and rational way, without the hysterics or drama so common in more contemporary YA novels. High school students would probably find the writing and plot of this book too simplistic, but for grades 6 to 8, it might be just right. It's also a must-read for adults who grew up reading books by Lois Duncan - there's nothing more interesting than looking back on the early works of a favorite author. As a bonus, also read Publisher's Weekly's Q & A with Lois Duncan. 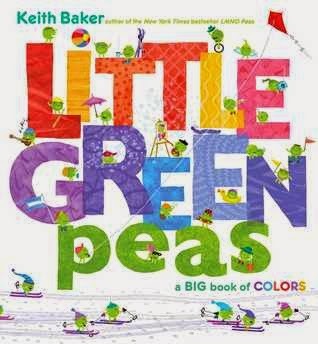 In this picture book, scenes populated by dozens of little green peas teach young readers about colors. Keith Baker's pictures are fabulously detailed, and kids could spend hours poring over each page and studying the activities of the busy little green peas. There is just so much to see, including a little green pea version of Rapunzel, peas taking ants and caterpillars for walks on leashes, and baby green peas sliding out of their pods into the arms of waiting parents. The book is formatted so that a given color appears on one two-page spread, featuring a few objects of that color as well as the word itself in big block letters. Then the reader turns the page to see the little green peas interacting in some way with the objects just introduced. This is definitely the most engaging of the peas books, which also include LMNO Peas and 123 Peas. My own daughter is just one, and she can't get enough of pointing at every pea on each page to ask me who it is and what it is doing. This is also one of those rare concept books that actually teaches the concept, but without becoming too boring and instructive. 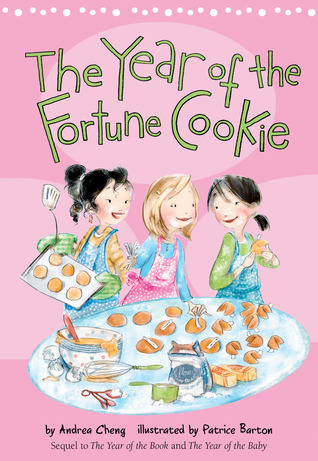 As she did in the The Year of the Book and The Year of the Baby, Andrea Cheng writes beautifully in The Year of the Fortune Cookie about Anna’s family life and friendships, as well as her experiences in school and her internal struggles and emotions. Refreshingly, even though Anna is now in middle school, the author does not introduce a sudden onslaught of superficial dramas. Instead, Anna expands her circle of friends to include other like-minded kids, takes on a service project to benefit the orphanage where her baby sister lived, and calmly and maturely works to convince a strict teacher that she deserves the opportunity to miss several weeks of school to make her trip. As in the previous books, parts of the story are spent reflecting on Anna’s cultural identity as compared with that of her American classmates, but the focus is less on a feeling of ostracization and more on a feeling of comfort in learning about her Chinese roots. In fact, this book is an overall comfort to girls entering middle school, as it provides a saner and less scary alternative to the picture of the middle school experience often provided by books at this level.